As you observe the book before you, it appears to be well-made with sturdy brass reinforcements throughout and the golden anchor of Kul Tiras emblazoned on the spine. A thick green leather has been used in the binding. Upon close inspection, it appears to be Orc skin - complete with battle scars typical of veteran Orc warriors. Next to the gold anchor along the spine, the title is branded into the leather: Kul Tiras Marine Field Manual. The Kul Tiras Marine Field Manual is issued to every recruit upon enlistment into military service, and is to be carried with all Marines to their area of operation - be it on land or aboard a vessel. It serves as a quick reference guide for a variety of important subjects relevant to carrying out the duties of a Kul Tiras Marine. If this is your first copy of the Kul Tiras Marine Field Manual, then that means that you have just undertaken the first step into a life of challenges and danger - but also a life with weight and meaning. If it is riches and fame you seek - then you're in the wrong place. Being a Kul Tiras Marine is not a job - it 's a calling. Those who answer the call can look upon the seas and the beauty of our nation as the legacy you are protecting - and the legacy you will leave behind. 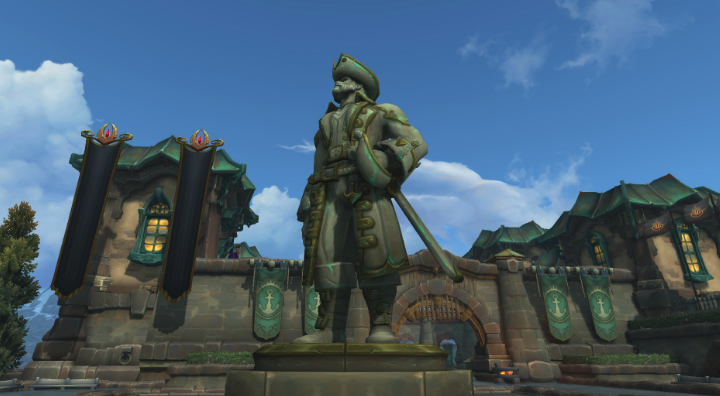 Kul Tiras was built upon the power of our Navy, the tenacity of our People, and our devotion to the Sea. Protect that which makes us strong, and embrace that which makes us Kul Tiras Marines. Lord Admiral Daelin Proudmoore: Hero of the Second War, loving father, devoted husband. His bravery and tenacity in facing the threats to our world shall forever live on in our hearts. May his name forever echo with the sound of the ocean breeze and the crashing of the waves.